Oh, this one was so much fun to write. I love writing bad guys as much as actors love playing villains, I think. I mean, admit it: Who do you think had more fun playing their character on Dynasty, Linda Evans or Joan Collins? Exactly. So, gay supervillains? Bonus! The best part of this, though, was probably the editing process. Tom Cardamone really had great feedback that helped me improve the story and make it darker and “a little more Arkham,” as he put it. After I finished this, I considered revisiting the characters later, maybe a reunion of sorts between Marcus and the good doctor. I’m still wondering who would come out on top in that confrontation…. 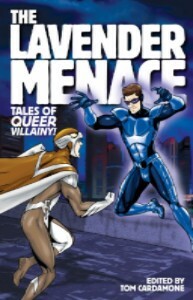 “Scorned” appeared in The Lavender Menace: Tales of Queer Villainy! published by Northwest Press. You can get a copy here. And check out the follow-up, Absolute Power: Tales of Queer Villainy! Marcus Harris had never seen the woman standing in the visitor’s vestibule adjacent to his cell, but her white coat, worn over a charcoal business suit, blared “psychologist.” She wore glasses and kept her curly blonde hair shoulder length. Sitting in the plastic chair reserved for visitors (who never came), she crossed her legs and settled a clipboard over her knees. When she smiled at him, it was completely unconvincing. So when I saw a hashtag that said #BoycottHawaii, I thought, “What’s that about?” and clicked on it. You never forget your first, right? This story was the first one I ever published. It still holds a special place in my heart, but when I looked at it now, it struck me that I didn’t realize at the time how long it was. Over 8,000 words? Seems excessive to me now. I’m a more concise writer, I think. This story originally appeared in the anthology Fool for Love: New Gay Fiction edited by R.D. Cochrane and Timothy J. Lambert and published by Cleis Press. A lot of the authors in here have become friends of mine, as have the editors. This story may have established a pattern for a lot of my future stories, in that they too revolve around love and somehow manage to work dogs into the equation. I’m planning to teach a workshop this summer at the community college on creating characters, so that’s had me thinking: What makes our favorite characters our favorite characters? It’s never quite the same thing every time, is it? If you follow me on any social media, it’ll be no surprise to you that I am a big fan of Captain Kathryn Janeway. No, she’s not a literary character (unless you count the Star Trek novels in which her character appears, and I do recommend Jeri Taylor’s Mosaic when it comes to that), but what makes her so compelling? Yes, Kate Mulgrew, the actress who portrays her, is a big reason I love her character so much, but beyond that, what is it about her? Is it some combination of background and character traits? Is it her love for coffee? (OK, that might play into it.) Is it that she’s from the Midwest and I’ve spent most of my life there, against my better judgment? Is it that she’s a scientist at heart? Maybe it’s that she stands up to anyone, no matter how big a bully they are. She’ll do anything for her crew, and she’ll tread along a narrow, confusing path between expediency and principle in order to get them home. She’s flawed and imperfect and completely determined. She’s not black and white. She’s fabulously complicated. She has a problem, she needs a solution, and the space between those two points is huge and full of conflicts. She’s not as noble as Jean-Luc Picard, not as tragic as Ben Sisko, and not as cavalier as Jim Kirk. (We won’t talk about Archer. Sorry.) She’s not always likable, but I’d say she’s the most relatable person to sit in the captain’s chair in any version of Star Trek. For me, at least. And that’s why I keep coming back to her. And why I keep thinking about the things that make her a great character to me, so that I can tap that kind of complication when I’m working on my own characters, even a gay high school teenager who’s the son of an Amazon. But, dialogue is always a goal of mine with writing, and I mean dialogue with the reader, not dialogue between the characters (although that’s a component of my writing, obviously). Social media is probably the best way for a midlist writer (or lower, like myself) to put a message in a bottle and send it across the sea to people who may open it and say yes, I get that. It goes back to grad school. Back in 2014, when I was getting my MFA in creative writing, I had a novel to write. This was my graduate thesis, and it was a dark speculative fiction piece about climate change, crumbling civilization, and the possibility of a new life on another planet, but mostly it was about family. It’s funny how, in the intervening years, what I wrote as basically science fiction looks scarily close to becoming fact (except for the whole other planet bit), but that’s the thing about fiction, right? Sometimes you tell a vision of the future and it comes true. Hey, my friend ’Nathan asked me a few questions about “Shepherd,” the story of mine that appeared in Foglifter magazine. He also said some darn nice things, but he’s a nice guy. He’s also a fantastic writer, so go read this and then check out his latest novel, Triad Blood. That’s less of a declaration and more an expression of hope, as in “wow, I hope 2017 will be happy.” Because 2016 was a bit of a Dumpster fire, wasn’t it? Between a horrific election cycle and the way the year killed off so many actors, musicians, and artists, by Dec. 31 I was ready to stay up until midnight just to watch 2016 die. Now that it’s over, though, I’m trying to look ahead and decide what I want to accomplish this year. I don’t really believe in New Year’s resolutions; they never seem to carry through the whole of the year, anyway. We make too much of a big deal about them, I think, and create unrealistic expectations (I’m going to get into the Best. Shape. Ever! I’m going to write a novel! I’m going to run a marathon!) and then the second week of January rolls around and we’re slouched in front of the TV on a Netflix binge with a pint of Ben & Jerry’s (those are single-serving containers, right?) and wondering where our motivation went. That said, yes, you can set a goal for yourself at any time of the year, but that doesn’t mean you shouldn’t set a goal at the beginning of the year. Basically, don’t stress about it, right? Anyway, to figure out my goal for 2017, I just have to look back to the last day of 2016: On Dec. 31, I submitted a short story for an anthology. On Jan. 2, I received the rejection notice. You know what? This pleases me. One, it means I finished that story. Dec. 31 was the submissions cutoff, and I was almost certain I wouldn’t make it. But I did. So, achievement met there. That they killed it two days later is less-than-optimal, but maybe the story was less than optimal. Maybe the reviewers were hungover from too much champagne. Or maybe they already had a story very similar to it. Or maybe they don’t like their science fiction a little bit gay. But whatever. None of that is in my control—except for the possibility that the story was less than optimal, in which case this is an opportunity to revise. My point, and I do have one, is that my submission might have been rejected, but if I hadn’t submitted, I would have had no chance of acceptance, either.